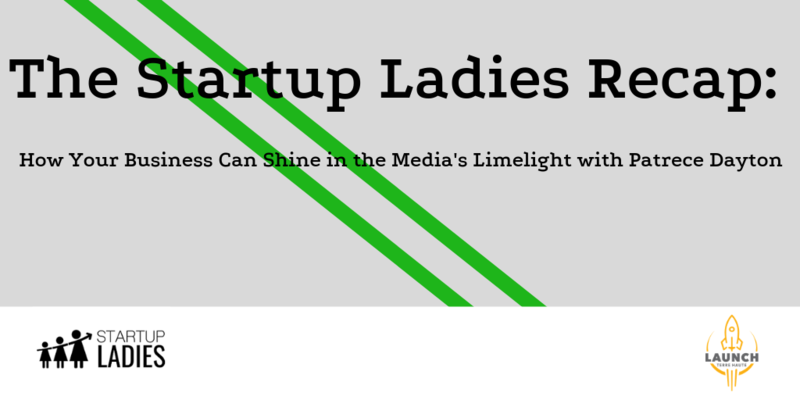 Did you miss our most recent event with The Startup Ladies? While all these monthly events are insightful and helpful, this one was relevant for everyone in business! We were so lucky to welcome Patrece Dayton to Launch Terre Haute to talk to the community about how you and your business can shine in the media’s limelight. She shared TONS of information with us and we’re so excited to share it with you! When it comes to interacting the media, Patrece knows the dos and don’ts. With several years in news reporting, she’s a great asset for our community, especially when it comes to helping out startups and small businesses get news coverage that helps them build their business. Remember that your business can create and share great content with the media – it’s like free advertising. And while it takes time to do, a great news story or article can be worth more than any paid advertisement! Make sure you’re leveraging PR and media relationships. TV, radio, and newspaper are looking for content all the time. This is FREE advertising! Take advantage of it. Getting to know the news outlet and what their reporters cover will help you craft your story to them. Find their contact information on the website, their social media profiles (professional ones, of course), get their email address and send releases directly to the person whenever you can. Utilize community calendars. Terre Haute has several great ones. And, your business might have other events in other markets. Event calendars are a great way to promote a fundraiser, your nonprofit, or other events that you and your business are sponsoring. Don’t forget about CAT P (yes, cat pee)! Clear. Accurate. To the Point. Apply this to all of your press releases. Make sure you’ve got a strong hook, an accessible contact, and times you’re available to speak. Give them enough information to know what your business, service, event or release is about, but not too much it’s overwhelming. They likely get 100s of these a month. Don’t hide from the negative. If a negative story comes out about your organization or business, always comment with your side of the story. Make sure you outline all of the possible points or questions someone could ask. Having talking points clarified can make any interview much more successful. You booked an interview! Send those talking points or FAQs ahead of time to the person you’re talking with. This gives them more opportunities to ask you questions, that they already have the answer to. Knowing what to expect for an interviewer helps you get more time with them, to convey confidence in what you’re talking about, and also ensures they get what they need to be successful. What to Wear to an Interview? Make sure you wear “power colors.” Bright solids will make you stand out and be memorable. – If you’re on TV, it’s a good idea to avoid greens. – Busy patterns can be distracting. – Ladies – Make-up can be a little more than what you might normally wear, but not too much. – On-screen – never a bad idea to dab on some fresh powder to avoid extra shine. In any aspect of media, be yourself. YOU are the expert on your business. Make sure you’re using social media. This is today’s word of mouth. Ask your friends and family members to share your posts and assist you in spreading the word about your business. Sharing consistently will make sure you’ve got good stuff out there for people to see. Keep in mind that media personalities will likely review your social media accounts and website to learn more about you, your business and your products, too. Record podcasts (we’ve got workshops for those!) or shoot videos. Allow your potential customers to see and hear your personality. All of these can be done at low cost, and we can connect you with professionals who can help. Be aware of the top subjects in media. Weather, safety/crime, education, and health. If you can tie your business or product into any of these things, you’re more likely to be picked up by local media. Sometimes even the fun “National Day of ___” could be something fun to get a mention or a quick interview. When it comes to getting your business into the media’s limelight, these tips will be essential in pushing your products or services forward, finding new customers, and creating a buzz around your business. While it may take more than one news release or story pitch to get coverage, never stop reaching out to media personalities and influencers. The Startup Ladies monthly events are meant to provide you with all of the information you need to be successful. Join us in November for Mastering Difficult Conversations to Help Your Team Reach Peak Performance with Kimberly La Grange. And subscribe to our newsletters to get other articles like this once, and advance notice of all our upcoming events. You can sign up on the bottom of our website. Did you attend this StartUp Ladies event? What other tips or information did you take away from Patrece’s presentation? Let us know and share your knowledge.